Come and be one of the 100 – 130 experienced choral singers from the four corners of Europe (and even further afield) sharing and exchanging cultural and linguistic differences thanks to vocal practice and sharing music. Vocal warm up : every morning comprehensive breathing and vocal warm up sessions take place in preparation for the day. Vocal coaching … generally takes place in collective workshops, according to vocal registers, quartets, affinities or even on rare occasions on individual basis. Whatever the case, the aim is always to improve our mastery of the difficulties inherent in the studied scores. Choral coaching : en tutti, here we tackle the musical difficulties from a purely vocal point of view, in the context of interpretive research. The choir master and the singing teachers work together in tandem with the choir. This type of work is useful when the scores have been prepared before the start of the course Participants should be prepared to study the music beforehand, although nobody is expected to be note-perfect on Day One. To help you prepare the music see our « Practical information page » where you will find the different tools available. At the end of the ten day course – from 12th to 21st July 2019 – we will give two public performances of « Requiem by Saint-Saëns and Schickaslked by Brahms » at the Saint Pierre des Cuisines Auditorium. 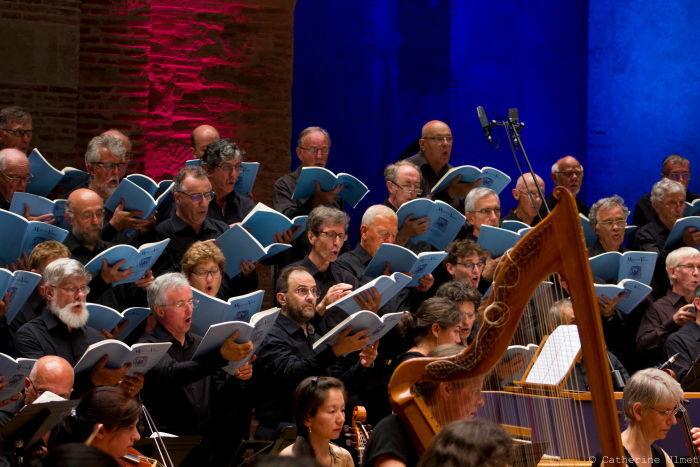 Come and join us in presenting these wonderful works and contribute to the European cooperation that we have been building around choral arts encounters, year after year in Toulouse.